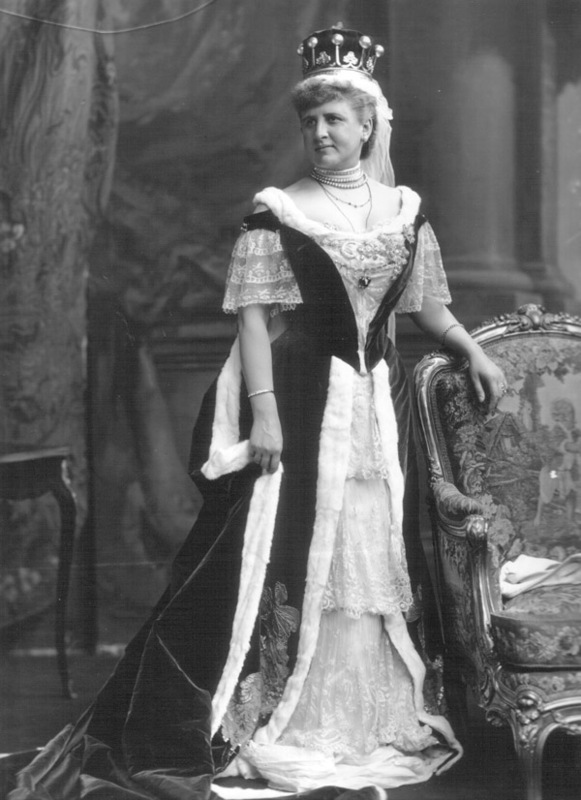 Louise Melissa, Countess of Orford (d. 1909), née Corbin. Sitter: Louise Melissa, Countess of Orford (d. 1909), n�e Corbin. Biog: Daughter of D. C. Corbin of New York; m. (1888) Robert Horace Walpole, 5th Earl of Orford. Descr: FL standing, with coronet. Furniture & Props: Painted backdrop with pillar. Photographer: Lafayette Ltd., 179, New Bond Street, London. Evidence of photographer at work: N.B. fabric placed under hem of lace skirt panel to create effect of greater length. Biog: Burke's Peerage; The Times, 5 May 1909, p. 13d. Costume: The Court Journal, 16 August 1902, p. 14a; The Queen, 16 August 1902, p. 257a.